Take A Deep Breath – Relax Your Wrist! During the last few weeks I have received sooooooo many interesting piano questions from you guys – here on PianoCareer.com, via email or Facebook. Even if the problems you’re facing in your daily practice are different, most of them have the same cause: tension (playing with immobile arms and wrists, playing ‘only from your fingers’ etc.). On ‘Ask Me a Piano Question’ I often describe the basics of a correct playing habit – those secret techniques used in the Russian piano school for achieving an amazing expressiveness and a brilliant technique. By the way, on the upcoming Piano Community Forum (launching on the 15th of February 2012) there will be a special board dedicated to this subject. I will post detailed video tutorials on relaxation, how to play by using the entire weight of our relaxed arms, how to channel the weight coming from our back into the keyboard and so on. Today, we’ll focus on a very important element of this ‘piano foundation’ – wrist flexibility. By understanding and mastering this easy technique, you’ll have access to areas of piano playing that seemed totally unreachable until now. Have you ever heard the term ‘breathing with your wrist’? Let’s take a deeper ‘dive’ and see what it really means. As I often mention, a comfortable and efficient playing habit is based on the ‘whole arm action’ principle. It means playing by using the entire weight of our relaxed arms. Our goal is to channel this weight into the keyboard (this way unlocking our technical and expressive ‘super-powers’ :)). Since only our fingers are actually touching the keyboard, we need to make sure that this arm weight reaches the fingers. Here’s where the wrist comes to our rescue! The wrist is the key element which connects our arms with our hands. If our wrists are immobile and tensed, it will be impossible to channel the arm weight into the fingertips and into the keyboard. This weight will simply remain trapped at the wrist and the fingers will move ‘separately’, without receiving the ‘back-up’ of the rest of our arm. As a result, our sound will be either too brutal, either superficial – but it will never be deep and beautiful. Moreover, this ‘separate’ movement of our ‘suspended’ fingers creates huge amounts of tension – which usually results in painful hand injuries. If our wrists are relaxed and flexible, on the other hand, the weight of our arms will naturally flow into the keyboard – this way offering us comfort, stability and an expressive sound. A relaxed wrist means no tension, no injuries and no pain. Have you noticed how a deep breath can relax your mind and you body when you’re tensed? The same happens with your arms, your fingers and your sound when you relax your wrist. Each time you relax your wrist, you ‘take a deep breath’ which ‘oxygenates’ your arms and the quality of your performance. So don’t be afraid to keep your wrist flexible! Don’t be afraid to take ‘deep breaths’ (by raising your arms and relaxing your wrists) as often as the music allows (especially before a new phrase, on rests and when playing non legato or staccato). Even when you play legato, make sure that your wrist remains relaxed and flexible. This way, your legato will be unbelievably smooth and expressive. Why? Because instead of simply raising one finger after pressing the next one (which creates a superficial, static and mechanical legato), you’ll be transferring the weight of your arm from one finger into the other – which results in a flowing, almost ‘vocal’ cantability. Therefore, by anticipating the flow of the melody with the movements of your flexible wrist, you can gradually master a special technique which is called ‘intoning on the piano’ (I mention this principle in my report “A New Perspective on Piano Phrasing” and I also plan to record a video tutorial in the near future). Moreover, a flexible wrist is the key to a powerful yet beautiful forte. If you hit the keyboard with force, the resulting sound will be powerful, but it will also be brutal and percussion-like. On the other hand, if you relax your wrist when your fingers make contact with the keys, if you press the keyboard and soften the landing of your arms with the flexibility of your wrist – then the resulting sound will be not only powerful, but also vibrant, deep, expressive and unbelievably long-lasting. No matter what you play, you should have the feeling that your entire arm is ‘pivoting’ on your fingertips – which is physically impossible if you keep the wrist tensed and immobile. A still wrist does not allow you (and the music you’re playing) to breathe freely. Keep your arms relaxed and your wrists flexible all the time – this is one of the most important elements of a comfortable, enjoyable and productive piano practice. On the 15th of February 2012 I will launch a Piano Coaching Program like you’ve never seen before (will include online paid piano lessons and a private membership forum). By the way, my email newsletter subscribers will have access to a really unique 50% off discount coupon during the first 5 days after launch. So keep your eyes on your inbox ;). I’m working on this project for almost a month (overcoming many fascinating forum-designing challenges LOL) and by the 15th of February it will be ready to rock!!! (Hmmm, as a classical pianist should I say ‘Ready to Baroque’? or ‘Ready to Impression-ism’? :)). The subject of wrist flexibility sounds fascinating. Theoretically I understand what you’re saying; but practically I’m not sure if I’m achieving the correct technique throughout the pieces I’m playing, especially before a new phrase, rests and on playing non legato and staccato. Does awareness of keeping the wrists relaxed and flexible come with practice and/or experience for inexperienced players like myself, please? And also the ‘whole arm action’principle. How does both affect the gradation of dynamics, please? This is something else I’m trying to improve. Your help would me much appreciated. Many thanks. The best way of ensuring that you’re doing it correctly is watching your teacher play with flexible wrists and simply ‘imitate’ her/him LOL. Wrist flexibility is not only about awareness. Yes, awareness is the first step (and it should be always present). At the same time, it is also a habit – and habits are created thought little mindful steps we take each day – which allow our body and mind to memorize the new sensations and make them ‘a part of who we are’. At the same time, it’s important to be shown how exactly to keep your wrists and what to do with them – so you’ll have a good, correct foundation on which to build this habit with awareness :). Yes, I think this summarizes the ‘formula’. Do you remember my video tutorial “The Secrets of a Correct Piano Key Attack“? Pay attention to the moment when I begin to demonstrate the proper key attack – do you see what I do with the wrist? These are the basics of wrist flexibility – and this is what allows us to play in a relaxed manner, at the same time creating a quality sound and developing a good technique. On the upcoming forum, we’ll talk a lot about wrist flexibility – and I’ll also record some more video tutorials on this subject! Have you read my reply to your question about playing simultaneously with different sound intensities? There I talk a lot about the ‘whole arm action‘ principle – also describing how we can use it for creating different dynamics! By the way, I replied to that question before reading this one – and it’s great that I intuitively covered this aspect as well :). Have a great weekend and talk soon! I especially mean: touch the keyboard of the time, etc. I can’t really imagine combining whole arm action and touching the keyboard all the time. Also, what do you think about this kind of play / technique? Is this whole arm action? To me it looks like fingers only… I’m really curious about you opinion. The tips shared in the article you mentioned are not bad at all! 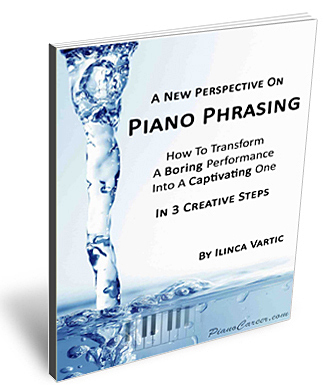 They are intended for beginners and intermediate piano students – and they are inspired from the Western approach on piano playing, being focused on a different perspective than the one we use in the Russian piano school. However, many principles are similar. Also, please pay close attention to the first tip: “Always place your fingers on the keys before you play them“. First of all – it doesn’t say ‘all the time’, it simply says ‘before you play them’. Imagine – how would you keep your fingers on the keys all the time if you have to play staccato or non-legato? Naturally, you’ll have to lift the fingers from the keys! Plus, these tips are not intended for professionals. The title of the article is “How to Play the Piano to Amateur Concert Level Status”. The main purpose of these tips is helping piano enthusiasts to avoid technical errors (hitting wrong notes). But this is definitely NOT a serious professional purpose – it’s simply one little step to the top of the mountain! One more thing: if we keep our fingers ‘glued’ to the keyboard all the time, if we ‘cling’ to the keys, if the motion range of our arms is limited and ‘shy’ – it’s impossible to play freely, it’s impossible to ‘fly’, to explore all the expressive possibilities of the instrument and develop all our pianistic skills. So while these tips can have some benefits if applied correctly (as the author mentions – with relaxed arms and wrists), they do not cover the entire complexity of the piano playing process. In piano playing, everything is subordinated to meaning and expressiveness. Some passages have to be played with little gestures, close to the keyboard – for creating a delicate, soft sonority. Others have to be played ‘daringly’, with big gestures, allowing your fingers to ‘land’ on the keys from a big height – this way creating a powerful, sparkling character. So which approach is correct? Both are! And both make use of the whole arm action principle! By the way, in a couple of days I’ll publish a new video tutorial where I’ll demonstrate how to use the whole arm action principle for creating a flawless legato (in other words – playing without lifting our fingers from the keys). And let’s not forget that playing from our entire arms is NOT our priority. Our priority is playing expressively, in a comfortable manner, without tension and pain, enjoying our practice and inspiring the audience during our performances. The ‘whole arm action’ principle is the best way of ensuring this result – because it represents the ergonomic ‘compromise’ between the functionality of our arms/fingers and the construction of the piano. And it’s definitely the best way of teaching beginners how to relax – this way avoiding dangerous hand injuries that are often discouraging a student, making her/him abandon their practice for good! You also asked me if the pianist from the video is using the whole-arm action principle or not. Yes, she is, even if it’s just a little. It’s obvious that she’s a relative beginner – but she’s doing a very good job!!! She is playing with a nice sound and relaxed arms/wrists. Arm/wrist relaxation is especially obvious from minute 0.21, when the texture of the musical text becomes wider. But, of course, with practice she will improve even more, and her gestures will become more confident, and the sound control – better. Take care and enjoy your practice! Thanks you so much for your reply Ilinca! Please let me know when you publish the new video. By the way, you can subscribe to my email newsletter (also getting a complimentary copy of my report ‘A New Perspective on Piano Phrasing‘) – and you’ll receive a notification each time I publish a new tutorial on PianoCareer.com! I figure that one of my major problems was not relaxing. I watched your video/articles about intonation, wrist relaxation, correct piano postures, and key attack. I tried to incorporate them to practice some simple pieces and scales slowly to get the feeling. I thought I’m relaxed, but I find I still feel sore or pain somewhere in shoulders or elbows if I practice longer, like an hour or something like that. It’s like I think and feel I’m relaxed, but the reactions seem to tell me I’m actually not. I have no idea how to solve problems like this, and improve. Thank you so much. It’s Kate again. I tried again today. Play very slowly and really pay attention to my shoulders. It seems to work. There’s no pain or sore in the shoulder this time, but after an hour, my wrist on the right hand sores. So I guess it’s because I payed attention to my shoulder but forgot to relax my wrist this time?! Thank you anyway. Until then, one little tip: learning how to play in a relaxed manned, with correct ‘flowing’ gestures takes time – so don’t be discouraged if you don’t see major improvements from the first try. With patience and correct guidance you’ll certainly make a wonderful progress and you’ll learn how to play with ease and fluidity, like a true professional (not to mention that you’ll get rid of pain and tension for good!). Thank you so much for your reply. I read your other reply for my other question too. It helps. Thank you. I would like to ask about expression and dynamics in Chopin’s waltz in E minor. Specifically, I find it hard to make a proper crescendo and decrescendo in parts where it’s needed, and my piano and forte sound almost the same. What could I do about it? Thanks for the complementary book! This site is loaded with useful information for serious pianist. I really enjoyed your web. Do you have any tips on modulation? for aural test? modulate to dominant, subdominant, relative major, relative minor. Your help is greatly appreciated. Thanks. Hope to hear from you soon. 99% of my tutorials (the ones you can find here – and the hundreds of videos and articles available on PianoCareerAcademy.com) are focused on the practical aspect of piano playing :). Among the tutorials available on my Piano Coaching Program you can find lots of theoretical information as well (everything a pianist should know for mastering a certain piece – and LOTS of theory that complements the step-by-step Course for Beginners and our progressive Scale Tutorial). I found your tutorial fascinating and very interesting! I’m currently practising some Chopin Etudes, but seem to be hitting a speed wall. Technical advice from you would be invaluable. You can find many tutorials dedicated to Chopin’s Etudes in the Members Area of Ilinca’s Piano Coaching Program. And, of course, you can also learn a lot by watching/reading Ilinca’s free tutorials (find all of them on this site, by going to our Archives). If you have other questions about the functionality of PianoCareerAcademy.com, don’t hesitate to ask – by sending me an email at pianocareeracademy@gmail.com!